In quantum optics an equation of motion for the density operator of an optical harmonic oscillator damped by a thermal bath of oscillators (reservoir) is derived. The optical mode may be described by the complex amplitude . The time-dependent Hermitian operator can be represented by a real-valued function of the form , the so-called -representation. The equation of motion for is the Fokker–Planck equation (FPE) , where is the decay constant of the optical mode and denotes the mean number of quanta in the thermal reservoir. The normalized stationary solution of this equation with the property (steady-state solution) has the simple form (this Gaussian function means a thermal distribution with average value ), and a time-dependent solution with a singularity at is (this known function is not demonstrated here). But it seems difficult to find other analytical solutions starting at with a maximum at . 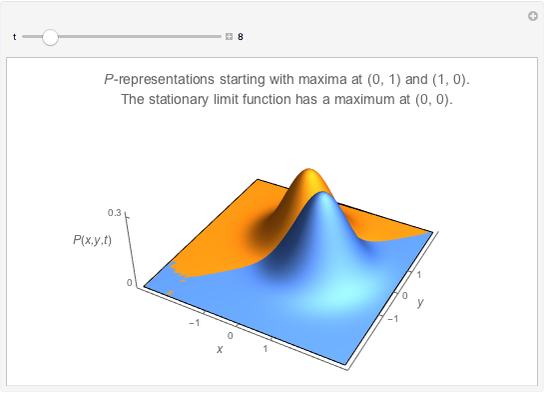 Here we show two of three completely shape-invariant solutions of FPE defined on the complete time interval that tends for to the stationary solution, and the initial functions have maximal values at , and , , where , . In their original meaning, the Fokker–Planck equations are partial differential equations for conditional probabilities in the theory of Markov processes, a special class of stochastic processes. In the quantum theory of a damped optical oscillator, Markovian properties also lead to a quantum FPE, valid for the quasi-probability density . The above functions were found as follows. , where are Hermite polynomials of order . The coefficients follow from the initial condition : . The problem is that to obtain an analytical solution for , either the integration or the summation cannot be carried out for many known elementary initial functions . In the case chosen here, when that the initial condition is the normalized function , then both operations (integration and summation) are possible; the result is . 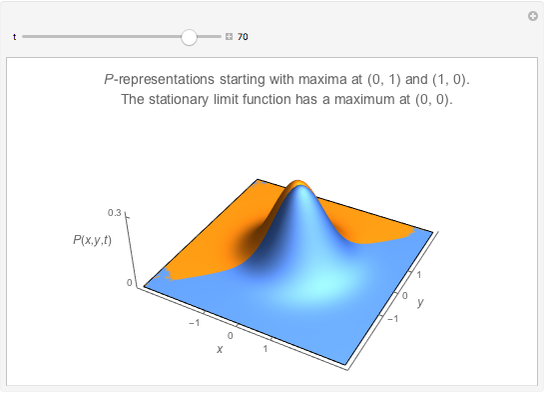 Returning to the original two-dimensional problem is easy: is one of three quasi-probability densities normalized for all (this Demonstration shows two of three calculated functions). P. Meystre and M. Sargent III, Elements of Quantum Optics, Berlin Heidelberg: Springer Verlag, 1991. J. Perina, Coherence of Light, Dordrecht-Boston-Lancaster: D. Reidel Publishing Company, 1985. M. Abramowitz and I. A. Stegun, Pocketbook of Mathematical Functions, Frankfurt: Verlag Harri Deutsch, 1984. W. I. Smirnow, Lehrgang der Höheren Mathematik, Teil 2: Frankfurt: Verlag Harri Deutsch, 2004. W. S. Wladimirow, Gleichungen der mathematischen Physik, Berlin: Deutscher Verlag der Wissenschaften, 1972. Reinhard Tiebel "Shape-Invariant Solutions of the Quantum Fokker-Planck Equation for an Optical Oscillator"